Using messengers with different features and with different text styles is very popular nowadays. WhatsApp Messenger is also providing many good features for their users to communicate with friends with text styles and nice features. If you would like to use strikethrough while you are texting your friends, you will find the steps on here. Actually this is very easy and you will able to do it in a few seconds. If you have any questions about stylish texting on WhatsApp, you can comment this page at the comment section below. This feature is not to be confused with underline text. It is already impossible to underline to texts on WhatsApp at the moment. 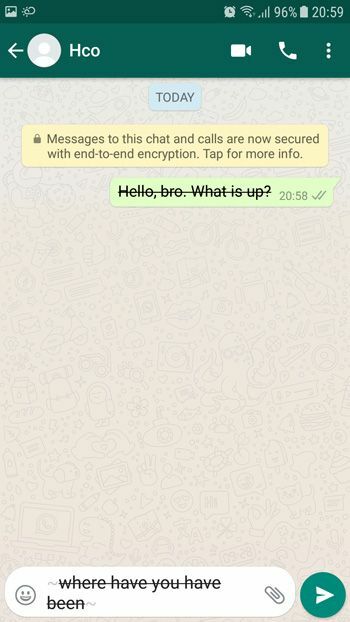 Do the following steps for send a strikethrough text to your friends on WhatsApp… It will work in any operating system. Tap new chat icon at the bottom right. Select a friend to chat on WhatsApp. Type “~” at the beginning of message. Type “~” at the end of message. You can see how to send a striketrough text on WhatsApp in the picture. The screenshot is from Android device but it will work at any device and operating system. Done! Now your message will look like “Hello“. Now you are done. All you need to type for strikethrough text on the application is “~Hello~”. This is quite easy and these symbols are available almost every keyboard of smartphone operating systems. However if you are having trouble with sending strikethrough texts on WhatsApp, please let us know. We are going to give more information on this subject for you and we will provide some useful solutions to fix your problems.